Red maple, scientifically known as Acer rubrum, grows throughout most of eastern North America. The red maple is easily identified in the autumn when its leaves turn a brilliant red. At other times of the year, the red maple may be difficult to distinguish from other deciduous trees, but there are certain characteristics that will positively identify it. Like most deciduous trees, the red maple is a broadleaf that is flat and thin. It is a simple leaf, meaning it develops only one leaf blade as opposed to the multiple blades seen on compound leaves. It grows to a height and width of approximately 2 1/2 inches. Red maple leaves have three lobes that are pointed at their tips. Two smaller lobes may be evident near the base on some red maple leaves. Sinuses, the spaces between lobes, are shallow on the red maple leaf. This differentiates it from others such as those of the silver maple, which also have pointed lobes but show deep sinuses. The small bumps or jagged points along the edge of a leaf are known as the teeth. Teeth may be large or small, rounded or pointed and may cover the entire length of a leaf or only portions of it. The red maple leaf has a few small, wavy teeth along most of its edge. Though the red maple leaf is easy to identify by its color in the autumn, it is a dull green throughout the growing season. The back side of red maple leaves are a very pale green or even white color. 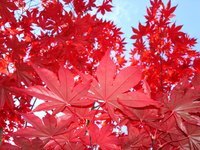 Though other maple tree leaves show similar colors during the growing season, the red maple leaf can be further identified by its smaller size compared with the leaves from other maple trees. Another excellent method of identification is to examine the stem of the red maple leaf, also known as the stalk or petiole. This will often be red or at least have a reddish tint to it on the front side. The petriole on a red maple leaf is also distinguishable by its longer length, often growing as long as 2 inches. How to Tell If Your Maple Tree Is a Sugar Maple?